Seyon Quartet from Arizona State University: Dylan Hong, Nathan Salazar,Patrick Feher,Kristen Zelenak. 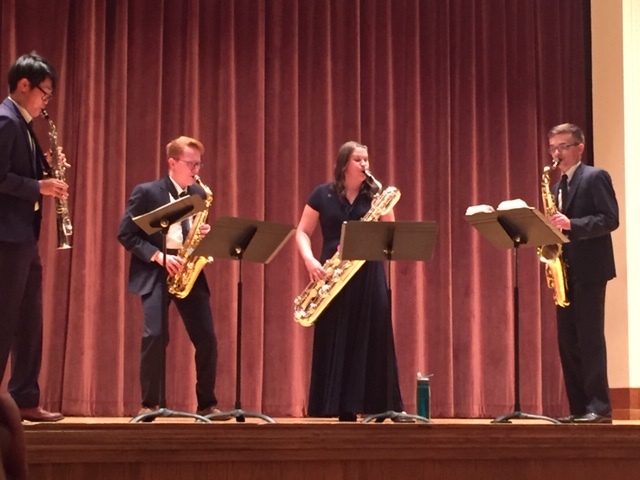 The halls of Akin Auditorium rang with beautiful music for 30 members of the audience in complete silence from four award-winning saxophone players — the Seyon Quartet. Andrew J. Allen, assistant professor of music, woodwinds, got a call from an old friend and invited them to come to play for the community and the students. “The baritone saxophone of the group, Kristen Zelenak and I go back many years. We both studied [at] Central Michigan University and we were in [saxophone] quartet together. She’s an excellent musician and I heard her quartet was very active and wanting to put on a tour in Texas, so she contacted me, so I said, ‘Of course, you can come in. I would love you to come to play for Midwestern community and for my students,’” Allen said. Midwestern students gave a variety of reasons for attending the Jan. 30 event. “A class assignment for the class of introduction to music appreciation,” Kellan Przilas, psychology senior, said. Przilas and other students who attended the Guest Artist Recital were there to just get a class assignment out of the way. One girl was there to hear the sweet sound of the saxophones, one song in particular. With that seats were taken and the recital began starting with a blast of loud saxophones into the first piece titled “Quatour, Op. 109 III. Final” by Alexander Glazunov. Then before “A Song for Margot” by Mark Weiser, Patrick Feher, tenor saxophone player, welcomed everyone to the recital and began explaining the next piece. “A great friend and mentor wrote this song for his wife,” Feher said. “A Song for Margot” was written in honor of the late wife of Penn State saxophone professor David Stambler, who lost a battle with cancer. “This piece was to celebrate her life more than to mourn it,” Feher said. With this, the quartet began again playing a somber but gentle song. After it was finished the quartet moved right along into “Rock Formations: Obsidian” by Evan Hause. This song was supposed to represent igneous rock breaking. This was done through a very fast and rock beat. 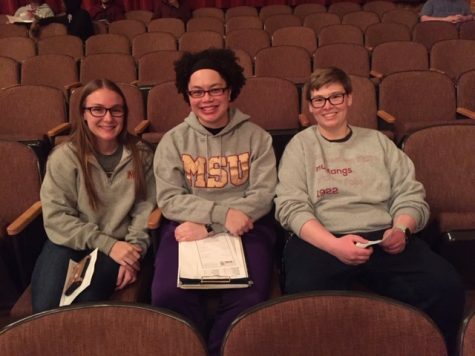 Midwestern State University students Brooke Lieker, Deidre Nicholes, Jessica Simek. “You can hear a little bit of rock and it’s always fun when we get to rock out a little bit,” said Feher. Getting close to the end the Seyon Quartet saved their favorite for second to last. Their favorite was “Prodigal child” by John Fitz Rogers. “Between the alto and tenor, it is meant to sound like the two sons fighting over their inheritance,” Feher said. The last song — their “a little built-in encore” Feher said — was “Capitol Punishment” by Carter Pann. After thanking everyone for coming, the Seyon Quartet disappeared behind the curtain and everyone dispersed. In an earlier version of this story, we incorrectly stated where Allen received his degree from. He graduated from Central Michigan University. The Wichitan regrets the error. 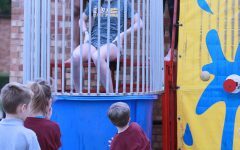 In addition, we incorrectly stated that Kristen Zelenak’s affiliation. She was the baritone saxophonist of the group. The Wichitan regrets the error. Finally, we incorrectly stated who the song was written in honor of. The piece was written in honor of the wife of Penn State saxophone professor David Stambler. His wife lost her battle with cancer. The Wichitan regrets the error.